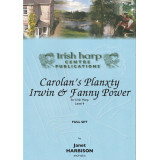 An Chuilfhionn (3 Editions)Harp Solo - Level 4 Song in Irish (18th C), Air with Variations (18t..
Carolan’s Concerto - SoloLevel 4This arrangement is from my own performance of this great concert st..
Carolan’s Planxty Irwin and Fanny PowerArranged in 2 versions for harp solo – for Level 2 (Low Inter..
Carrickfergus - SoloLevel 4The famous song associated with this air is actually not so old – but it ..
Danny Boy - AirHarp Solo - in two versions for Beginners and a second version for Advanced playersIr..
Lady Iveagh - soloComposed Thomas Connellan 1682Harp solo - Level 3Arranged Janet HARBISONThis stron..
Pachelbel’s CanonHarp SoloLevel 4 Janet’s harp-friendly version that is very accessible and per.. Port an bPucaiHarp Solo - Slip JigLevel 4This slip-jig tune has the feel of an ancient tune about it..
She Moved Through the FairHarp SoloLevel 4 - SoloOne of Ireland’s most beautiful airs – known both a..
Sunday MorningHarp SoloLevel 4 - Historical AirTranscribed by Edward Bunting in 1802 from the harp p.. The Boyne Water - SoloLevel 3This is a solo version of the great war-march – known in Northern Irela.. The Faery QueenHarp SoloLevel 4 - Historical AirThis is an historic harp piece from the 16th century.. The Hawk of BallyshannonHarp SoloLevel 4 - Historical AirThis is another strong historical harp piec.. The Wild GeeseHarp SoloLevel 4 - Historical AirOne of the great harp compositions of the 1690s, this..